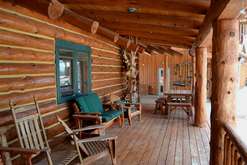 Sleepy Creek Lodge is a gentle mountain property that has a custom log home, large workshop, views of Pikes Pike & Grape Creek frontage! A covered entry welcomes you into a home designed with an open floor plan and main level living. The foyer, great room and kitchen’s beamed ceilings with tongue & groove inlay provide a spacious yet warm & inviting setting. Framed in the great room windows are snow-capped views Pikes Peak and the bordering Florissant Fossil Beds National Monument 5,900+ acres. Imagine this ideal space for activities & gatherings of friends and family! The master suite offers a comfortable retreat with an adjoining bath, walk-in closet, sitting area & private balcony. 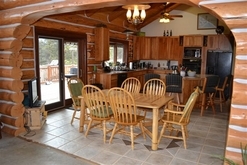 Downstairs is a large family / game room with access to a walk-out deck & three additional bedrooms. Custom wood working, extra large windows & skylights can be found throughout the home. Solar panels and a wood burner supply the source of energy for the radiant heat in the home. A short walk through the breezeway places you in the oversized garage & workshop. Here you will discover a built in office & rooms large enough to accommodate an assortment hobbies or home based business concepts. The surprising gentle topography, large meadows & towering Ponderosa pines greet the morning sun as it rises over Pikes Peak. Perimeter & cross fencing make four separate pastures for rotating stock & preserving grasslands. Over 800+/- feet of Grape Creek traverses the property – providing a water source & a variety of vegetation for livestock & area wildlife. There are no covenants on the property. Located off a well maintained county road and just off paved Highway 24, it has year-round access with an easy commute to nearby communities for work, shopping or medical care. 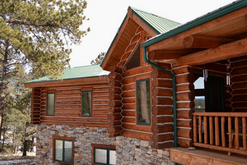 Sleepy Creek Lodge is a place to fulfill your dream of living in a Colorado log home, awakening to the beautiful mountain scenery & mild climate and enjoying rural mountain lifestyle to its fullest!